So I saw that a few members were asking for certain information before and some suggested compiling all of the known information we have and since I like to be organized and stuff, I thought it would be neat to do it myself. Also, does the thread title sound familiar? “Be The Batman” – Live the complete Batman experience as the Dark Knight enters the concluding chapter of Rocksteady's Arkham trilogy. Players will become The World's Greatest Detective like never before with the introduction of the Batmobile and enhancements to signature features such as FreeFlow Combat, stealth, forensics and navigation. New Combat and Gadget Features – Gamers have at their disposal more combat moves and high-tech gadgetry than ever before. The new ‘gadgets while gliding’ ability allows Batman to deploy gadgets such as batarangs, the grapnel gun or the line launcher mid-glide while Batman's utility belt is once again upgraded to include all new gadgets that expand his range of forensic investigation, stealth incursion and combat skills. Remote Hacking Device - Replaces the Cryptographic Sequencer, and includes new features such as activating equipment in order to set up traps or distract enemies, etc. 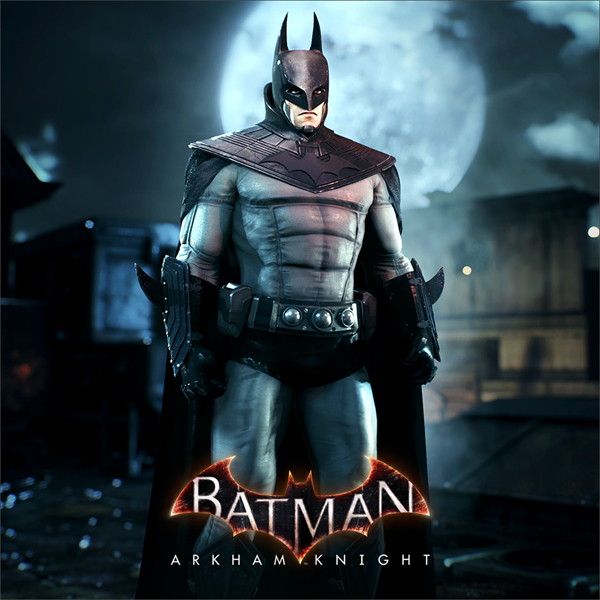 Similar to Arkham Origins, Arkham Knight will have side missions focusing on the villains called "Most Wanted"
"KO Charging Thug" - "Some enemies charge at you, and must be taken down with a quick[fire] Batarang [...]"
Gotham City Stories - Play as Batman’s key allies in narrative missions extending their storylines, from both before and after the events in Batman: Arkham Knight. Legendary Batmobile with Themed Tracks - Drive the most iconic Batmobiles from Batman’s 75-year history, on custom-built race tracks, each themed to that Batmobile’s specific era. Every Batmobile will be drivable across every race track. Joe Chill wrote: No cape. No cowl. No CODE. Harley will have "unique weapons, gadgets, and abilities"
There will be "custom skins"
The game has received an “M” rating—a first for the franchise. There are going to be Funko POPs. FUNKO POPS. Everything We Know will constantly change as more information regarding the game comes in. If there is any I might have missed, please feel free to tell me and point me to its source so I may link it in the post as well. Last edited by BuNKiTZ on Jun 17th, 2015, 7:25 pm, edited 21 times in total. Wow, you've clearly put a lot of work into compiling this list - and it's awesome. With all the different threads, it's a bit difficult to keep track of everything that we do know so I'm grateful. If the world chooses to become my enemy, I will fight like I always have. Oracle has a dope clock tower. Great list, I'm sure this took you quite some time to finish but your work is very appreciated it. It's good to see all of the information compiled in one space. For the part about art book, I believe there are two separate ones. I noticed this a bit after reading R_R's post. There is one book, which he mentions is the Ultimate visual guide which is found here. Then there is another art book, which compiles the art from the Rocksteady trilogy, and has Rocksteady listed as an author here here. - Some buildings have no load screens making you able to break through windows and seamlessly enter them. And still hear whats going on outside. Thanks, you two! I've updated the post and now include the Amazon links to those books, as well as some more Batmobile details and Penguin for the character list. In the New 52 skin pack, we know that at least one of them is the suit worn by the Prime Earth Bruce, since that was the one pictured with the collector's editions. Favourite Villain: Does it matter? Ghjklbnm wrote: In the New 52 skin pack, we know that at least one of them is the suit worn by the Prime Earth Bruce, since that was the one pictured with the collector's editions. Yeah, I know, but I won't delve into the pre-order bonuses as there's a dedicated thread for that. I've been yearning for this kind of list for some time now. Thanks! Laederlappen wrote: I've been yearning for this kind of list for some time now. Thanks! No problem. You were probably one of the users I saw asking for a thread like this. Maybe. Updated the details on the PS4 exclusive Scarecrow Nightmare pack. I didn't notice that it apparently comes with "custom skins." Can't wait to see what those are. Worst Nightmare, anyone? Lovely job, Bunk. You got me just that little bit more excited about Knight now. BuNKiTZ wrote: No problem. You were probably one of the users I saw asking for a thread like this. Maybe. Hm, seems like I'm very ignorant when I watch trailers.. And now I got even more hyped than I thought I could be! It should absolutely be some kind of nightmarish/monstrous skins, has there ever been a Scarecrow/Batman-amalgam in the comics or tv shows? Like a Bat suit made out of straws and potato sacks, for example.